Chikwere Onyekwere: A Nigerian Star is born! Normally, it would be almost sacrilegious to call a Nigerian by the nickname of 'star' since that is the football name of regional rival Ghana (Black Stars). However, in chess this is the only way to describe the ascent of a player who has scored stellar results amongst top-flight competition. At 20, Chikwere "Chi-Chi" Onyekwere has quickly become Nigeria's new star after rising as the nation's Junior Champion some years back. Chikwere's first successes began when he dominated the age-category tournaments in Nigeria. He won three under-14 national titles and in 2000, won the Junior Championship of Nigeria at age 15. He then began to spread his wings by representing Nigeria in youth events… first the 2001 World Youth (under-16) in Spain, the 2002 African Junior in Botswana and again the 2003 World Youth (under-18) in Greece. Apart from the youth scene, he competed in the 2002 Olympiad in Bled, Slovenia and became the youngest ever to compete for a Nigerian Olympiad team. He also qualified to play in the 2004 Olympiad in Mallorca, but was unable to compete. 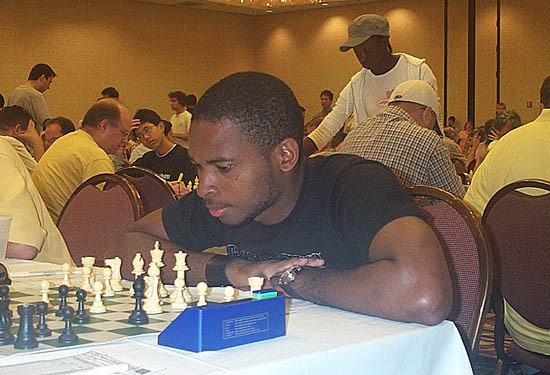 Back in 2003, Chikwere was one of 24 players to face Georgian Grandmaster Zurab Azmaiparashvili in a simultaneous exhibition prior to the All-Africa Chess Championships. He was the only one to send "Azmai" packing in defeat. In 2004, the young master set sights on the US and made his debut in Las Vegas at the North American Open. He tied for 3rd place in the under-2200 section and tournament victories followed in Massachusetts and Louisiana. He has also traveled to Houston to partake in chess exhibitions. 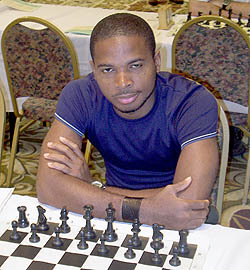 In 2006, he returned to Nigeria to win the Nigerian Breweries Chess Championship and became the youngest national champion in history at age 20. Most recently, he has scored well in major U.S. events, the World Open (5-4) and the recently-ended U.S. Open (7-2). The future appears to be bright for the Nigerian lad. Years ago, Theophilus Caifus mapped out a five-year plan for producing the nation's first Grandmaster. With active International Masters such as Fola Akintola, Odion Aikhoje and Oladapo Adu, Chikwere can draw inspiration and hopefully strive to become the nation's first Grandmaster. The confident young man will continue to make an impression while based in the US, but as mentioned in the directive, funding will be needed to develop the wealth of talent in Nigeria. Time will tell if Chikwere can soar like a Nigerian Eagle. Chikwere "Chi-Chi" Onyekwere in a trademark pose at the 2006 U.S. Open.